This image shows an interesting way to add brand new uncirculated shiny pennies next to random ones to form a design that really stands out among our standard/regular penny tile sheets, especially when seen from certain angles. Length (left to right) = 32 3/8 in. Width (top to bottom) = 32 1/8 in. Notice the length has the shiny pennies in more of a straight line while the width has the shiny pennies in a zig-zag. You can increase the length and width of this basic loop design to your desired size. For example, keeping the same width, and going to the next length up, we get this longer design measuring (left to right): 43 3/4 in. Our penny sheets can be installed on the outside of your design. Penny tile sheets being placed around the loop design. Some combinations of lengths and widths to choose from are available below and their measurements are rounded up or down to the nearest inch. The next width up (43 in.) is also available below (red) with prices for different lengths. (If you want your design bigger than the numbers you see below, please let us know). If you are interested in ordering this Loop Design, start by placing your order for the BASIC design size ($330) and let us know what is your chosen length and width and we'll reply with details. Because of the brand new uncirculated pennies involved in this design, we do not stock this item and it is manufactured after you place your order. To preserve the look of the shiny pennies in the design and prevent oxidation, it is recommended to apply sealer as soon as possible, preferably before grouting. The pennies should also be kept as clean and dry as possible before sealing. We cannot recommend any sealing products, installation methods, maintenance or anything else related to your project. Consult licensed tile installers or other knowledgeable professionals/sources. 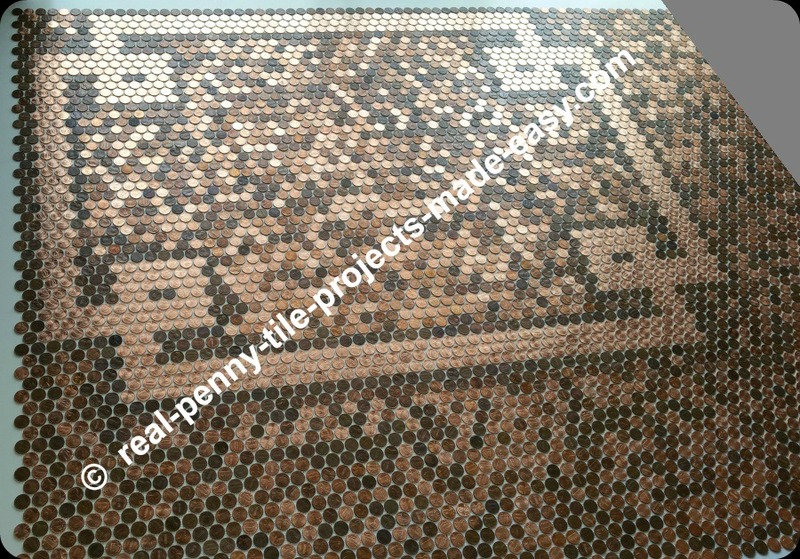 Our part in this process is only providing the handmade penny tile sheets to you, our beloved customer. Thank you. Go to TOP of this page: Loop design made with all new shiny pennies.